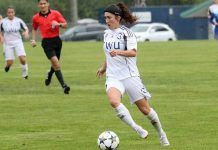 SEATTLE – The Trinity Western Spartans scored two goals in the opening 18 minutes on their way to a 2-0 victory over Seattle University Saturday evening in Seattle, Wash.
TWU’s second year midfielder Jenaya Robertson (Delta, B.C.) got the Spartans their first goal of the season at 5:34 of the opening period when she slotted a one timer from just outside the six on a missed clearing attempt from the Seattle defence. Fifth year forward Isabella Di Trocchio (Burnaby, B.C.) score the Spartans second goal of the night at 17:05 when she stole a Falcons’ square ball to go in alone on the Seattle net. Di Trocchio made no mistake as she placed the ball into the right hand side of the Falcons net to give the Spartans a 2-0 lead. The Spartans, who outshot the Falcons 3-1 in the opening 45, would take the 2-0 lead into the half-time break. Seattle had the better opportunities in the second half as they had the edge in shots 2-1 and corner-kicks at 3-1. 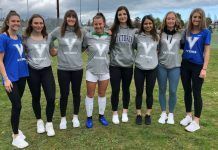 But fifth year TWU keeper Ally Williamson (Langley, B.C.) was up to the task as she earned her first clean slate of the 2016 preseason. The Falcons had three keepers share the goaltending duties for Seattle. Mackenzie Curry played 31 minutes and took the loss, while Abby Bouck and Ashley Rough played 28 and 32 minutes to finish of the match for the Falcons. Next up for the Spartans is NCAA Div. III Haverford College on Tuesday, August 16. Match time at TWU’s Chase Field is set for 6 p.m. PST. The Spartans open up Canada West conference play on Friday, September 2 in Abbotsford, B.C. against the Fraser Valley Cascades. 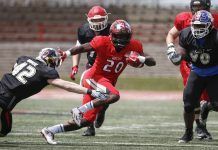 TWU’s Canada West home opener is on Friday, September 16 when they will host the Victoria Vikes.